In your hectic daily life where your priorities always seem to be outside yourself, the internal voices you are likely to hear are the ones that speak the loudest. The squeakiest wheel. But when you take the time to listen in — through meditation, nature walks, time alone in a quiet place without distractions — the wise inner voice with its rich deep true resonance, rises above the clamor. You can be sure it is your wise inner voice because it is calm, loving, positive, and non-judgmental. Unlike the other voices in your repertoire, it is never hurried or desperate. Next to it the other voices feel jangly, almost caffeinated. The wise inner voice will never tell you to do something violent, unethical or wrong. It will never demand that you do what it says. It is not a master, but a guide. Its purpose is to put you in harmony with your own nature, not to change you into something other than yourself. Once you have found your inner voice, and it may take time, be sure to continue listening in. Never take your wise inner voice for granted. After each question be very quiet and let your own wise inner voice answer you. Be patient. Your inner voice speaks in many different languages — symbolic, synchronistic, intuitive, and dream. Pay attention. Perhaps the book with an answer for you will pop off the library shelf into your hands. Perhaps you will feel suddenly compelled to call a friend, whose experience will help you with your problem. And always listen when you find yourself giving someone else advice. It is often meant for you as well! If you listen in on a consistent basis, you will eventually be able to hear your clear wise inner voice speaking in very plain language. It is the voice of the wellspring that feeds you, rooted in the collective consciousness, deeply connected with all that is. Staying in touch with that inner voice will keep you balanced, assure you that you belong right where you are, deepen your sense of connection, and enhance your pleasure in every moment. I wrote this book in the early 1990’s when I was physically incapacitated for almost a year. It is a compilation of notes I took during intensive meditative sessions that I organized in a way that made them readily accessible. I did not change a word of the writing, just rearranged it. You may notice that, unlike anything else I write, it is written to ‘you’. The ‘you’ was me. I was asking questions and the answers rose up from within. I never considered this channeled writing with some other being or entity. It was just an inner conversation with the universal wisdom available to all of us. Still, I wasn’t willing to claim the words as mine, so on the cover of the book it doesn’t say ‘by’ Stephanie Noble, but ‘from the meditations of’ Stephanie Noble. If you are not the center of your own universe, who is? And why? Of course you are the center of your own universe. Each person, animal and plant is the center of its own universe. You must hold that perspective, or no one will. That is the perspective allotted to you in this life. That is where your consciousness seeded and grew. To pretend that you are not the center of your own universe is to go against nature. And who will thank you? Who are you expecting to fill the void you have vacated? Where have you put your consciousness? And isn’t it crowded over there? Is that person thanking you for moving in on his or her space? Of course not. To be in a subject mode does not exclude developing empathy and understanding. Quite the contrary. It gives a piercingly straight connection to others, a direct line into their hearts. When you are subject, you are residing where others expect to find you. It is like having an ‘Open’ sign on the door to your heart. When you are object, your sign reads ‘Out to Lunch’ and no connections can be made. Because you are out trying to guess what others are thinking of you. Always of you. The object mode spends a lot more time thinking about the self. The derogatory term ‘self-centered’ refers to people who are being objects, always looking from the outside in, imagining what the world thinks of them, and adapting themselves to suit. Climb back inside yourself. Explore who you are, what you like, what you care about. Learn what activities and experiences replenish your inner wellspring, and take the time to give that to yourself. Then, from that centered grounded position, that great sense of belonging and completion, look outside yourself, tap into that infinite bounty within you and share your talents with the world. Only as the subject of your own life can you function effectively in the world. My women students nodded their heads to the shared challenge we face in being there for everyone we care about, sometimes almost or completely forgetting our own needs and preferences. The body of the book is ‘Topics of Concern’ arranged alphabetically. Readers of the book often told me that they just open to any page and find just what they need in that moment. So we tried that in class, and there were several ahas of understanding as to why the topic on that page was relevant for each person right now. One student awoke to her calling! So who knows what riches are possible when we open to the wisdom available to us all at any moment? If we practice quieting down and being open to it, wisdom shines through with a warm loving light on all that had seemed dark and scary. Learning to listen in is part of what we do in our meditation practice. 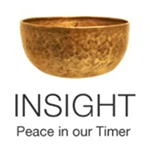 That’s why it’s called Insight Meditation. Aha! This entry was posted in inner wisdom, insight, Paramis, Paramitas, Tapping the Wisdom Within, wisdom on June 10, 2016 by Stephanie Noble.